For nearly ten years Volkswagen had the Eos folding hard-topped convertible in its showrooms, but it wasn't a big seller. 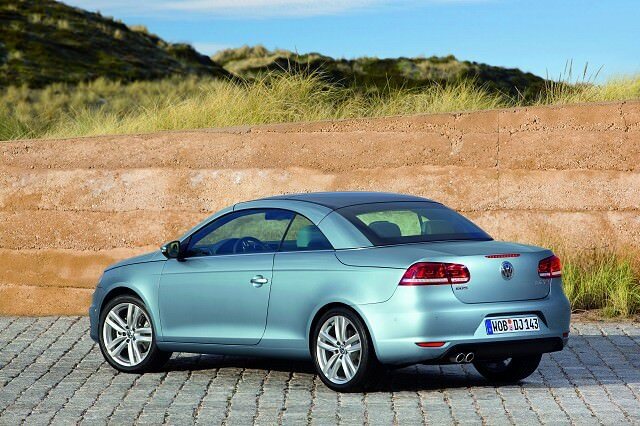 For nearly ten years Volkswagen had a folding hard-topped convertible in its showrooms, the Eos effectively filling the gap left by the Golf Convertible. Thing is, Volkswagen brought that back, which meant that the company already had a large open-roofed offering for sun-loving drivers. The Eos was at the top of the range, that folding hardtop a joy to use and making for a more secure, coupe-like look when closed. Although it was effectively based on the Golf, the Eos managed to carry a bit more prestige than its humble hatchback origins should have afforded it. The styling was partly responsible, the Eos among the most neatly executed of the folding hard-topped cars that seemed to be offered by every manufacturer from the mid-2000s. It escaped the backside heavy look of its rivals, looking smarter regardless of whether you had the roof up or down. Likewise, the interior was attractive, Volkswagen leading the way among its mainstream rivals then as it does now. Given its Golf origins it’s no surprise that the Eos was offered with largely the same engine line-up as its hatchback relative. Some markets even got an automatic-only 3.2-litre V6, though most buyers in Europe stuck with a predominantly four-cylinder petrol line-up, with 1.4 TSI (turbocharged), 1.6 naturally aspirated and 2.0-litre TSI options, as well as a 140hp 2.0-litre TDI diesel. The Eos drove nicely too, riding well, being hushed at speed - roof up or down. Do check the roof for leaks, as it’s known to do so, particularly on earlier cars. For a drop-top the Eos is surprisingly practical, with four genuinely useable seats, and a sizeable boot with the roof up - when folded the luggage space suffers. Trims were simply Eos and Sport initially, Volkswagen changing that to S, SE and Sport latterly, the Eos getting a facelift in 2011, bringing its style more into keeping with the then Volkswagen look. The 1.4 TSI is a good choice, and perfect if you’re doing low mileage, while the benefits of the 2.0 TDI’s economy prove worthwhile on longer journeys. We’d probably go for the 2.0 TDI, not least as its plentiful low-rev torque makes it an easy drive. Avoid the auto, as it knocks the emissions and economy for the worse. Roof can cause issues (leaking, sticking). Still an attractive car, and one you could convincingly use as an everyday option, so long as you’re not planning on heading to the airport with suitcases in the boot with the roof down. The fuel consumption and emissions are relatively high these days, but it's cheap to buy and its modest Golf underpinnings make it relatively inexpensive to service, too, certainly compared to premium drop tops. Well worth a look, if you like being looked at.